If you want to improve your handwriting then remember “there is no age to learn”. No matter how old you are, you can start learning writing beautifully with the handwriting apps on the mobile phone. These applications are completely compatible with kids so you can use them to teach your children how to write gracefully. 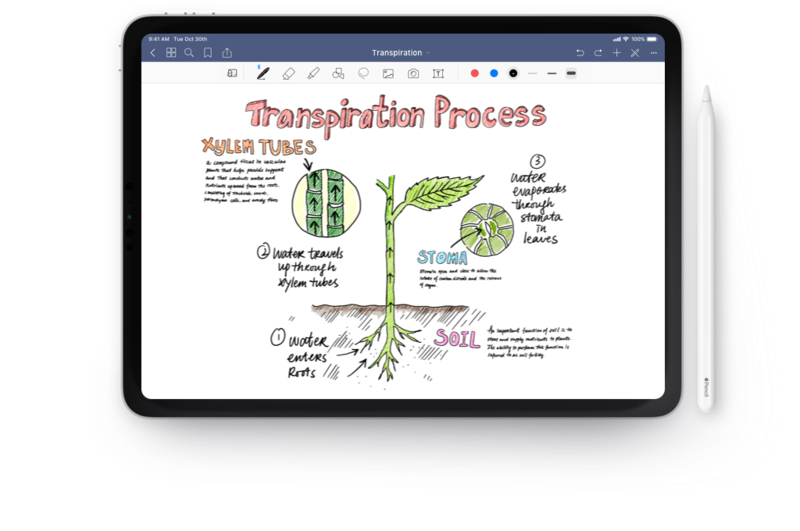 In this article, you will get a detailed description of the features of the top ten handwriting apps for iPhone and iPad. You might be wondering what makes these applications really worthy. These apps come with a variety of writing tools which is helpful in enhancing the handwriting. They also offer exercises to practice good handwriting in an artistic manner. You can get a true feeling of writing while using such kind of apps. Apart from handwriting, such apps are also beneficiary for drawing and sketching with their inbuilt tools. You can mentor your child well using this app to learn handwriting and other artistic skills. These are the great apps consisting of courses with level to judge the growth and bring improvements while learning. Now, read more to know about these apps in a better way. You can download these apps by visiting the official websites and their links. As the name suggests, this app is specially designed for school going kids and have all the tools and other specialties to make them learn easily and quickly. It uses an innovative way to make the kids learn the English alphabet and numbers from 1 to 10. It has all the exercises to teach about inclination, trajectory, the direction of lines, curvature while writing and other small tricks which can play a good role in making the handwriting better and attractive. Since they come up with many games and interesting exercise, so the kid also put all the efforts to learn writing. The complete learning course is divided into two modules: Silver and Gold. It is featured with animated graphics and wonderful sound effects which draws the attention of the child while learning. You can use this app on both iOS and Android devices for free. GoodNotes 5 is featured with advanced digital ink technology which makes the handwriting much better than others. This application is compatible with both Microsoft Word and Powerpoint to make changes into it while converting it into a PDF file. This app is wonderful to make notes and take its print out for making projects and other such things. You can get a large library of covers and papers to make your handwritten file more attractive. It is not only for kids but can also be very beneficent for adults as well. You can select any template as per your choice to make your content more vivid and graceful. It is a modern way of collecting notes and have many provisions to save and share the made document. You can directly upload it to cloud websites like DropBox, Google Drive and OneDrive. However, to avail all its features, you need to buy this app for $7.99. Here comes another app to collect notes digitally. Using this app, you can write in PDFs, slides and forms with no hassle. 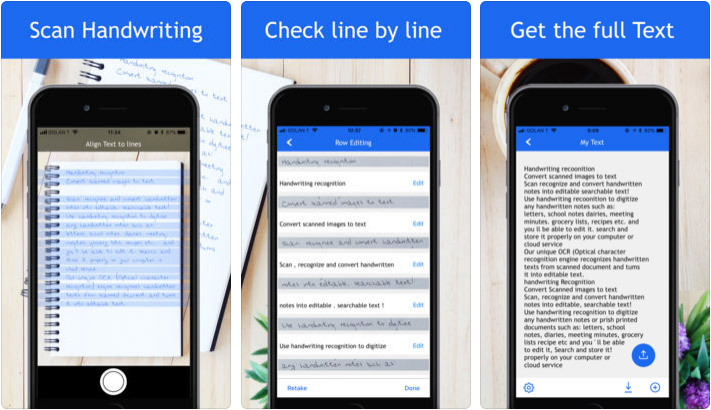 It is a very popular application for iOS devices for taking notes. It offers many handwriting tools to make the notes quicker and attractive. It enables the user to convert the notes written in his/her handwriting into text form in an elegant manner. You can use several colours and pencil to do so. It has a special feature known as multi-note which allows the user to work with multiple notes simultaneously. It also gives the compatibility to the app to convert the text file into PDF and upload them on DropBox, iCloud, OneDrive, etc., for security. You need to pay $9.99 to use its services. 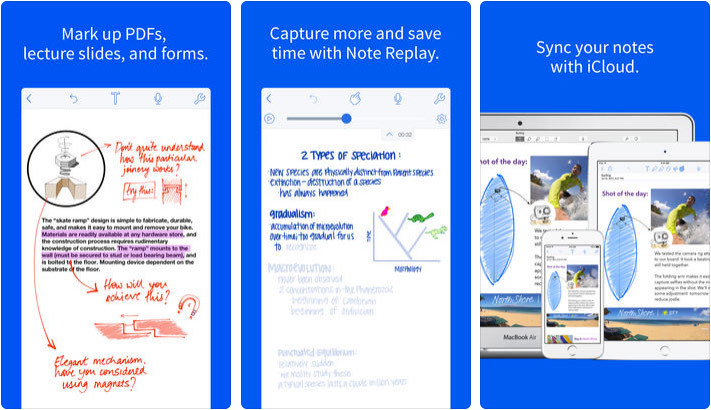 If you are looking for a different feature and feeling to write on your iPhone or iPad, then you must go for Notes Plus. Featured with many tools and sensory advantages like impressive ink effect and palm rejection, you can enjoy writing with it in a clear and simple way. You can write notes on PDF and DOC files easily. This app works well with Apple pencil and shapes the imagination into texts. It can make your creations more beautiful with its effects and tools. You can export your file directly to any platform like Google Drive, OneDrive, DropBox and many others to keep your file secured for future usage. This app supports over 52 languages giving more range to users. You can explore its all features practically by paying $9.99. 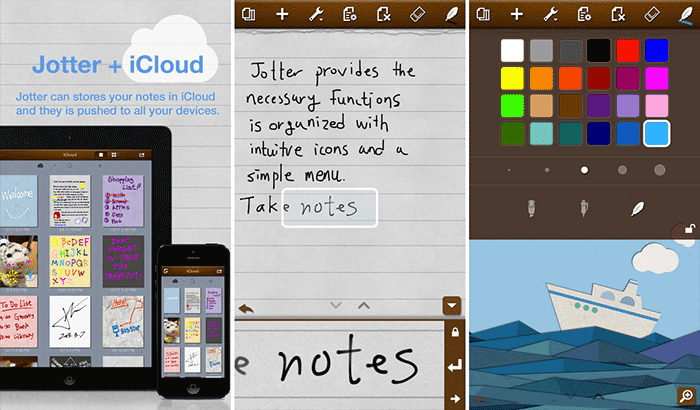 Here comes another cool app to take the notes named as Noteshelf 2. 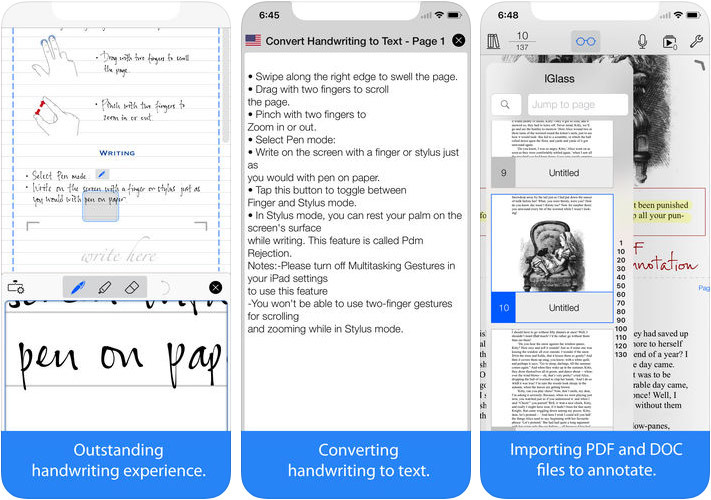 You can easily annotate your PDF or DOC file in your own handwriting elegantly using the app. There are many easy-to-use tools which offer different styles to put in your notes. It is compatible with many languages so you can express yourself in any way regardless of your language. It also enables the user to record the things in an audio form which makes it different from other apps. It is a wonderful app to make the work easier and take notes quickly and in a different way. However, you need to purchase this app for $9.99 for using its tools and features. As the name suggests, you can easily write in your handwriting and get it printed as it is with the help of this app. It is capable to covert the tests into capital letters, cursive and regular script as per the preference of the user. 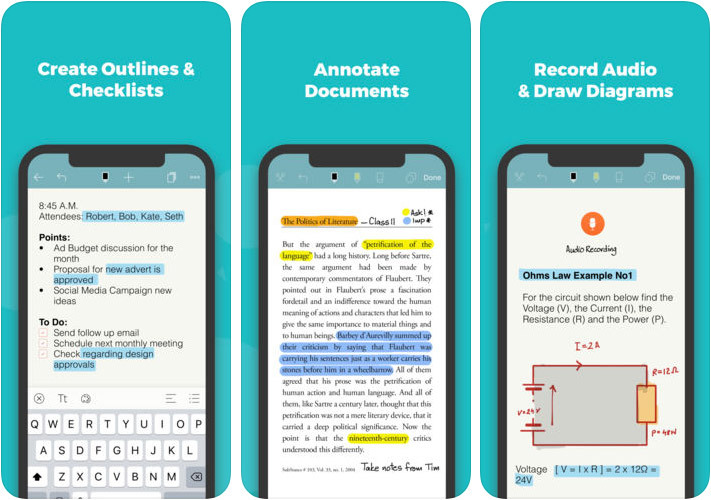 This app uses an advanced technology called OCR (Optical Character Recognition) which is widely used nowadays to make notes from scanned paper and helpful in jotting it down editable text. You can also share the documents with other editing apps easily using it. You can use both free and paid ($0.99/month) version of the app depending on your needs. You can find many handwriting apps for kids on the App Store, but selecting the best one can help you to get the desired results. This app has a very simple and intuitive interface with all the attractive tools to engage the child in learning. It uses an innovative and attractive way to teach tracing a and writing numerals and alphabet. You can check your kid’s progress easily from its dashboard and can prepare PDF file to make worksheets for him/her. It has many other features which can help in improving your child's capability to write and learn. You can download it by paying $4.99 and explore more about it. 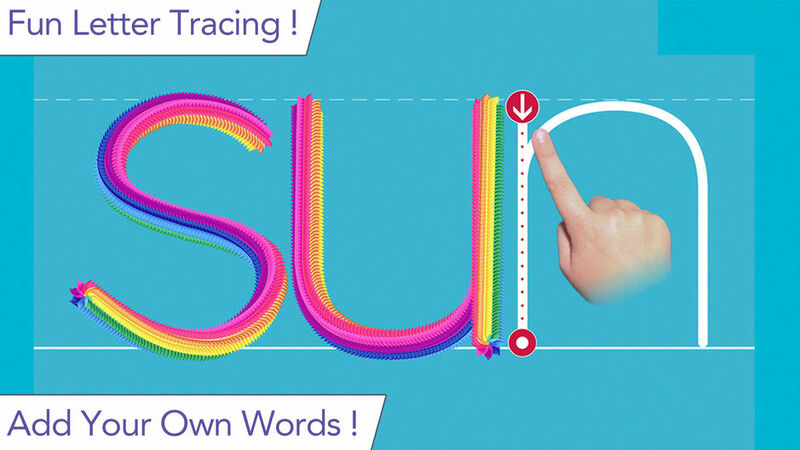 This app uses a simple way to make the tracing and improve the curvature while writing a word, letter or number. It is specifically designed for kids to make them learn how to write increasing their concentration power. 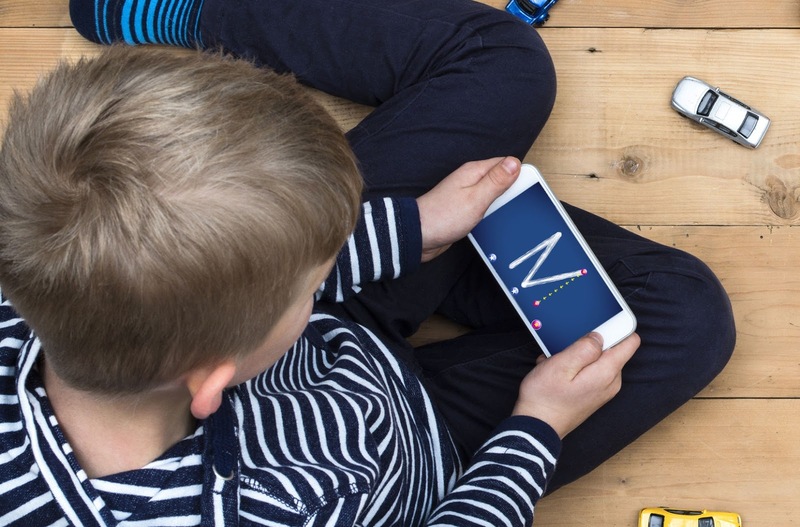 This app offers rewards and other effects to make the child work on it elegantly. It saves the progress of the child and has multiple ways to teach them in a better way. For using it, you have to buy this app for $3.99. As you can guess by the name, this application simply focusses on cursive handwriting skills of the Montessori child. 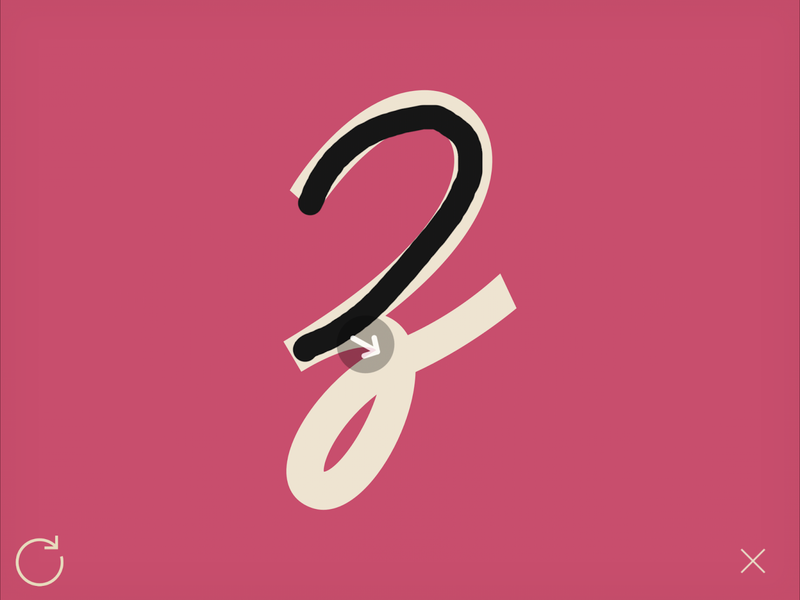 It has a beautiful and elegant way to teach how to read, write and learn cursive from a to z letters. It is also featured with sound effects which make the kid learn the pronunciation of every alphabet properly. This app is also divided under some stages to check the progress of the child. It helps the child learn about both uppercase and lowercase letters and read and write them properly and beautifully. You can buy this app for your kid for $4.99. Jotter is a wonderful and modern app with many advanced tools and functions for jotting down the notes elegantly. It offers different colours and ends with variations in point to write the notes as per the desired. You can also highlight your text using its handy tool. Apart from writing notes, this app is also superb for making drawings and sketches. It works properly with all the sensors of iOS devices and makes the task very interesting. You can save your created file in any format like JPEG, PDF, PNG or DOC. Furthermore, these files can also be uploaded on drive easily for security. You can buy this app at a very affordable price of $0.99. You have seen various handwriting apps which include both for kids and adults. You can make your child's handwriting better with the listed app along with keeping all your notes quickly using the notepads listed in this article. You can select your application as per your necessity as many of these apps are payable and there is no free version available to be used. If you have faced any queries while using any of these listed apps, then please put it down in the comments. Furthermore, if you’ve accidentally deleted any precious data like photo, voice memo, message or note, you can always use Gihosoft iPhone Data Recovery to get them back even without backup easily. If you use android phones, you can also choose Gihosoft Android Data Recovery.